TICKETS: Suggested price is $15; subject to availability; zone restrictions may apply; cannot be combined with any other offer. Please call the ticket office at 609.258.2787 for more details. 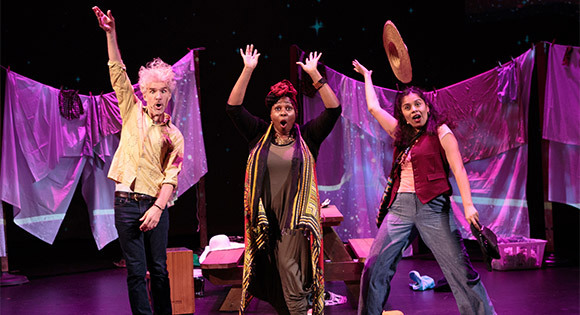 Enter the freewheeling musical world of Grammy® winner Dan Zanes, vocalist and multi-instrumentalist Claudia Eliaza, and special guests for an interactive folk “opera” that takes audiences on a far-out ride to the galaxies and back. During a joyous dusk-to-dawn trip through the stars, passengers on Night Train 57 will discover the power of friendship and community with the sounds of 21st-century handmade sing-along music. Festive original folk songs played on guitar, trombone, mandolin, flute, harmonica, ukulele, percussion—and, of course, voices!—power the train, as homespun sets and video projection create an unforgettable intergalactic atmosphere. Visit psychedelic stars, navigate the challenges of whimsical space travel, and celebrate communal music-making while singing, laughing, and dancing towards a deeper sense of life’s best possibilities. This world-premiere adventure welcomes travelers of all ages and sensory levels. Relaxed performances provide a conducive environment for individuals on the autism spectrum, with cognitive or developmental differences, or other sensory and communication needs. The objective is to allow these individuals and their families to enjoy live theater together. McCarter has presented five relaxed performances in the past, including productions of Into the Woods, White Snake, Ken Ludwig’s Baskerville: A Sherlock Holmes Mystery, the Muppet Sing-A-Long Movie, and last season’s appearance by Laurie Berkner. In addition to the sensory friendly nature of the performance, professional staff will be on hand to assist parents and caregivers, a family restroom will be available, and there will be designated activity and relaxation areas in the lobby.